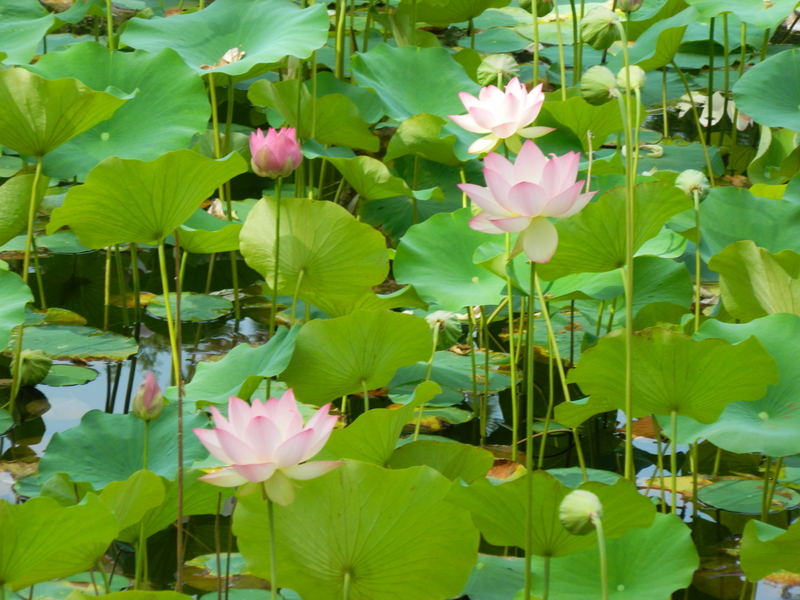 One of my favorite places to breath and reflect is at Lotus Pond at Ananda in Northern CA. When it is in bloom, as you can see, it is an amazing joy of beauty. The Divine with pull us out of the very mud of our own creations and draw us into the clear air of Spirit. Wherever we are in any moment of time, if we are not feeling joy and love, we are not attuned fully to Spirit. Our intellects may be engaged, yet if our hearts are not also fully in tune with Loves Presence, we are hopping on one foot simply trying our best to keep in balance. It takes a lot of effort. God is everywhere and we can see and feel the beauty of Spirit and the ever present goodness that exists everywhere, simply because God is everywhere present. We come from that which is everywhere present and as we embrace that more fully, life blooms like the picture of the pond that you can see. With that sweet prayer I hope that you too find fulfillment in your relationship with the Divine.